Better days are harder to find. 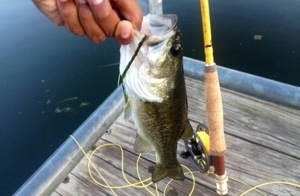 There’s not a lot out there that can equate to the feeling of fly fishing a new glass rod with a fun little popper. 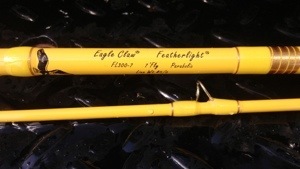 That’s how awesome today turned out to be when my Eagle Claw Featherlight was delivered to my door. At first I thought someone was playing ding dong ditch when I heard my door bell ring. Then after peeking out the door- much to my surprise and delight was a 4′ PVC pipe. Instantly I knew it could be only one thing. It was my 5/6wt Eagle Claw I ordered from The Fiberglass Manifesto (TFM)- a seven-footer 2pc. So naturally I had to go out and fish it. The irony of the colors slowly sunk in as I rigged everything together. Something seemed familiar but I didn’t know what- the obvious was even screaming at me as I seated the Rio Gold fly line loaded reel. 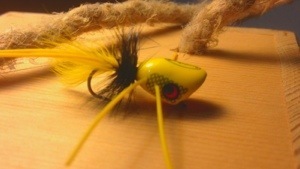 Then finally Captain Obvious came too- when I tied on a mellow yellow size 8 BoogleBug popper I realized everything was black and gold; Army colors. The only other glass fly rod I’ve cast before was my 5’9″ CRG 3wt. This Eagle Claw was over a foot longer but still not the long rifle like my 8’6″ St. Croix. So I consider this the carbine of my quiver and my CGR my side arm. It casts well and doubled over quite well when I caught my first fish. Fishing a little popper on glass as the sun sunsets on a Texas lake- well, again better days are harder to find. Golden to say the least.